I've done 'Robin Hood' once before, but I'm developing all-new music for this screening. It's a challenging film for modern audiences, I think, because Fairbanks framed it a story of aristocrats, and so it takes forever to get to the actual "Robin Hood" part. Today, we'd expect a film titled 'Robin Hood' to get right to the action in Sherwood Forest, with the green-suited bandit robbing from the rich and giving to the poor. The Fairbanks 'Robin Hood' isn't set up that way, so we'll see how patient our audience is on Sunday afternoon. Keaton's 'Spite Marriage' (1929) is a film I've never done before, but I'm eager to see how it fares with live music at our screening, set for the Manchester (N.H.) Public Library on Tuesday, June 26 at 6 p.m. Growing up, books such as Rudi Blesh's 'The Films of Buster Keaton' made 'Spite Marriage' seem like a really minor film—Keaton's sad last gasp, with little of the originality and excitement of his great 1920s silent features. 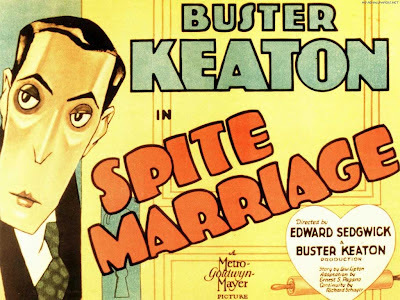 But the truth is, Keaton remained a popular star throughout the early talkie era, and 'Spite Marriage' wasn't badly received by audiences at the time. It has some pretty inventive sequences, I think. However, 'Spite Marriage' was released with a recorded musical score—one that's interesting from an historical perspective, but which now sounds pretty dated, at least to my ears. So for 'Spite Marriage,' I'll try to do my usual thing of supporting an older film with updated music that sounds something like what today's audiences would expect when they see a film in a movie theater. This one is also free, so hope to see you there as we bring Buster's last silent feature back to life. 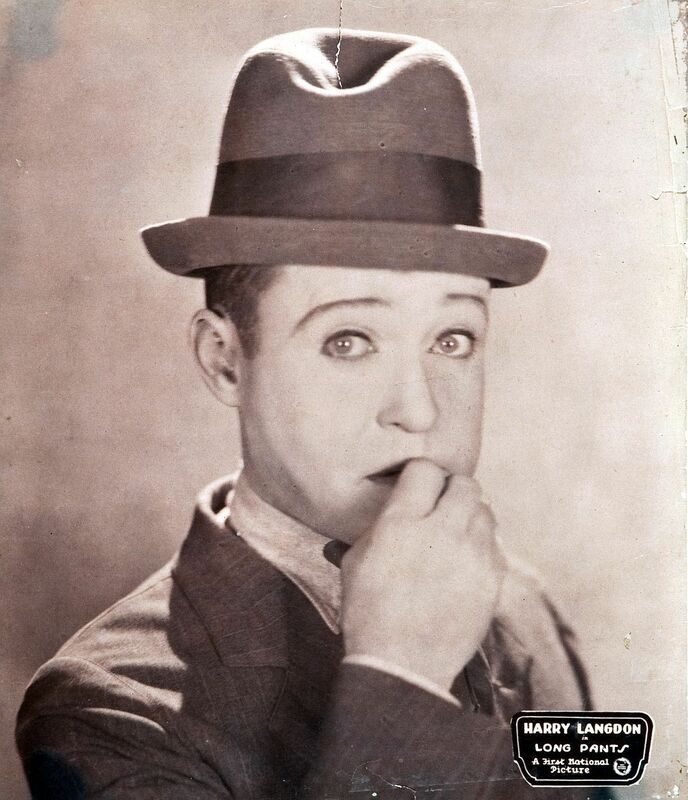 It's early Sunday morning (1 a.m.) and I've just completed the two-and-a-half hour drive home from Brandon, Vt., where this past evening we screened Harry Langdon's 'The Strong Man' (1926) to an audience of 90 people. I actually covered the 145.2 miles in 2 hours and 28 minutes, and 50 seconds. But who's counting? 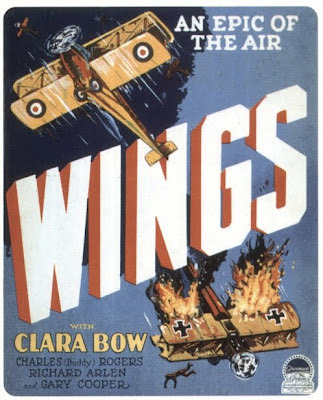 It's been a busy time, but before hurtling headlong into the week to come, I felt compelled to record a few impressions of this event, as well as a showing of 'Wings' (1927) in Plymouth, N.H. that took place on Thursday, June 14. Both screenings were well attended, with close to 100 people showing up for each. That's a pretty healthy turnout in my world, and it really makes a difference in getting the audience involvement thing going, I've found. Not sure if there's any specific reason for it other than good films and effective publicity. In Plymouth, our 'Wings' screening was marked by my use of the goofiest introduction I think I've ever come up with. After finishing my opening warm-up improv, I turned around to find an unexpectedly large audience! I was so delighted it brought out the comedian in me: "Thank for you coming to our screening of 'Wings,' the greatest movie ever made about American's favorite bar food." I got laughs. "Thank you—I've been practicing that line all day," was my response. In Brandon, I absolutely nailed music for Buster Keaton's short feature 'Sherlock Jr.' (1924), with everything falling into place. Audience reaction was big right from the get-go. Things went equally well for the main attraction, Harry Langdon's 'The Strong Man' (1926), for which we got spontaneous applause at the climax, when Harry's cannon causes the walls to come tumbling down. The more I see of 'The Strong Man,' the more I admire it. Yes, it's widely thought of as Langdon's strongest feature, and credit is given to a very young Frank Capra, whose direction helped it immensely, I'm sure. But in addition to the comedy (from Langdon) and the strong story (from Capra), this film stands as a remarkably poetic illustration of some very important and timeless ideas. What ideas? Well, how about 'The Meek Shall Inherit the Earth?' And poetry? For starters, consider how the movie takes the whole "Strong Man" circus/vaudeville imagery and catapults it into the arena of morality: in this case, the division between the peaceful Cloverdale residents and the newly arrived saloon crowd. And take the Cloverdale townsfolk, who march through the streets singing 'Onward Christian Soldiers' in search of their savior? And then there's Harry, on stage at the saloon before a disbelieving audience, attempting to perform miracles (and succeeding, for a time), and whose antics are climaxed by an ascent to the heavens (just to the rafters, but out of view of the audience), followed by a resurrection that includes doves (of peace?) flying out of his pants. Harry as Jesus? 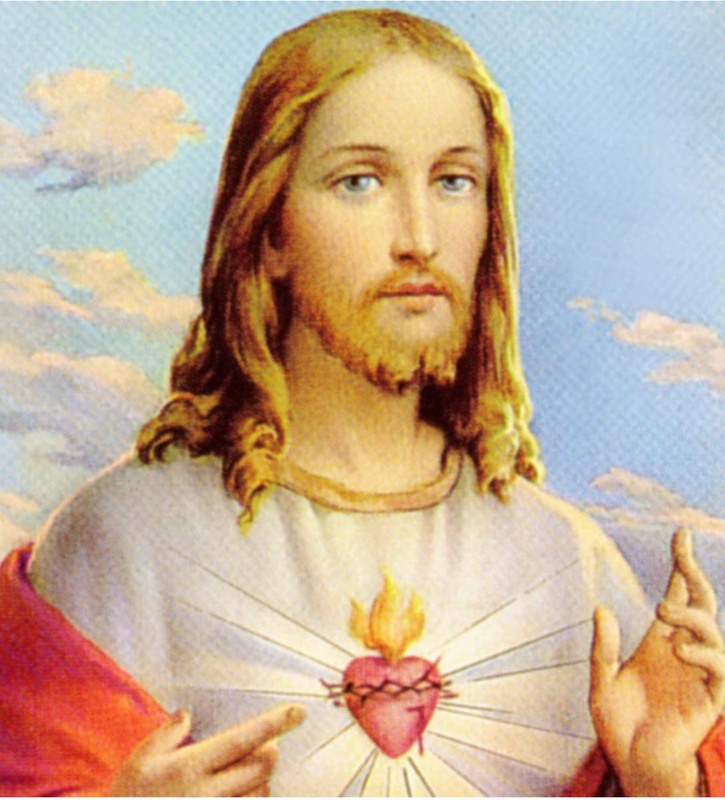 That's a little much, especially because Jesus never wore a hat. But a lot of 'The Strong Man' resonates in this fashion. And then there's Harry's hopeless search for a girl he's never met, only to discover that she's blind, but then it's her very lack of sight that allows her to see the best in him. Boy, don't get me going or we'll have a doctoral dissertation on our hands. But really, the film is that rich. but will 'Wings' wow 'em in Plymouth? It's a marvelous place to screen silent film with live music, I think, and I have to tip my hat to Peter and Maureen Clayton, who've run the facility for nearly the past 40 years. They're part of a vanishing breed of local theater of owner/operators that could be facing the final fade-out, what with all the changes in the recent movie business. Above, Peter Clayton dons his jacket to man the ticket booth prior to the screening. Like all owner/operators, Clayton does it all: earlier, he spent most of the day working on installing vinyl siding on the building's immense north side, which is about the size of a soccer field turned on end. The Leavitt's exterior, seen from Route 1. The complete lack of parking is only clue that the facility dates from another era. Peter Clayton, ever the showman, managed to score a theatrical poster for 'Metropolis' on eBay, which was put to good use in the theater's timeless oversized standing sidewalk sandwich board. A close-up of the handwritten sign above the box office. With my name on it! Big time. And finally, a full view of the ticket booth, which is almost comically small, perched in front of the Leavitt's entrance lobby. What better venue to show yesterday's vision of tomorrow than yesterday's version of a moviehouse? And so we did, and what was nice was that prior to the screening, I asked how many people had never been inside the Leavitt before. Almost everyone raised his or her hand! 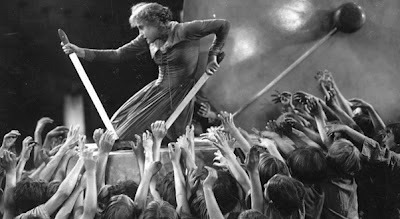 So it felt good to have introduced people not only to one of the great silent films, but also a terrific theater! As for the music, it really did fall together in a way that surprised even me! I just was in the zone right from the start. I've done the film several times already this year, so I'm sure that helped. At the end, I was treated to a standing ovation by a handful of attendees, but I'll take whatever I can get! Charles 'Buddy' Rogers, Clara Bow, and Richard Arlen in a scene from 'Wings' (1927), the silent World War I drama that won Best Picture at the first-ever Academy Awards. First-ever 'Best Picture' to be screened with live music at Flying Monkey in Plymouth. 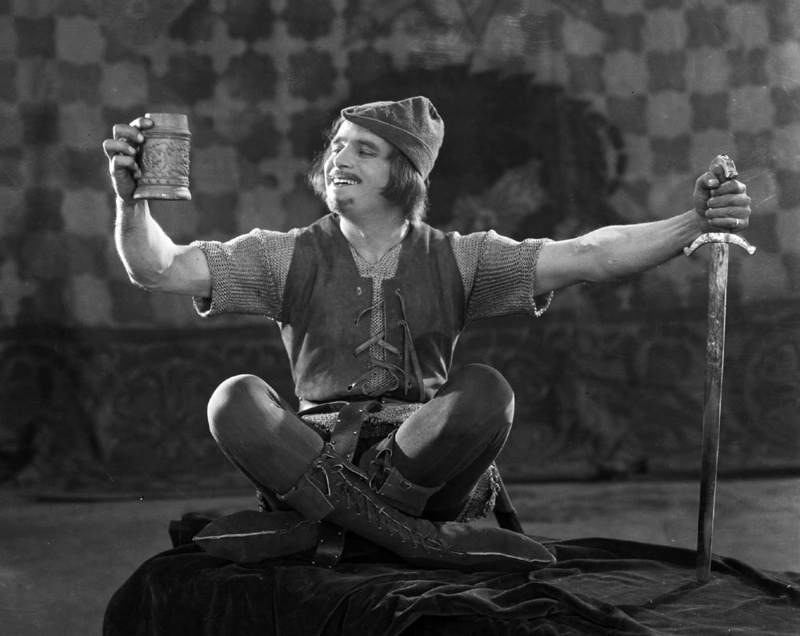 N.H.
PLYMOUTH, N.H.—Silent film with live music returns to the Flying Monkey Movie House and Performance Center in Plymouth, N.H. on Thursday, June 14, bringing to life classic films made before Hollywood learned to talk. 'Wings' (1927), a World War I epic that won 'Best Picture' honors at the very first Academy Awards, will be revived for one showing only on Thursday, June 14 in honor of Flag Day. The film, a blockbuster hit in its original release, recounts adventures of U.S. pilots flying combat missions behind enemy lines at the height of World War I in Europe. 'Wings' stunned audiences with its aerial dogfight footage, vivid and realistic battle scenes, and dramatic love-triangle plot. In honor of Flag Day, 'Wings' will be screened with live music on Thursday, June 14 at 6:30 p.m. at the Flying Monkey Movie House and Performance Center, 39 South Main St., Plymouth, N.H. Admission is $10 per person. For more information, call (603) 536-2551 or visit www.flyingmonkeynh.com. "Seeing 'Wings' on the big screen is a great chance for everyone to appreciate what our servicemen and women endured in World War I," said Jeff Rapsis, who will perform original music to accompany the film. "It's a war that has faded from our collective consciousness, but it defined life in the United States for a big chunk of the 20th century. This film captures how World War I affected the nation, and also shows in graphic detail what it was like to serve one's country a century ago." Aviation buffs will also enjoy 'Wings' as the film is loaded with scenes of vintage aircraft from the early days of flight. The Flying Monkey, recently restored by new owner Alex Ray, began showing silent film with live music in 2010 as a regular part of its offerings. 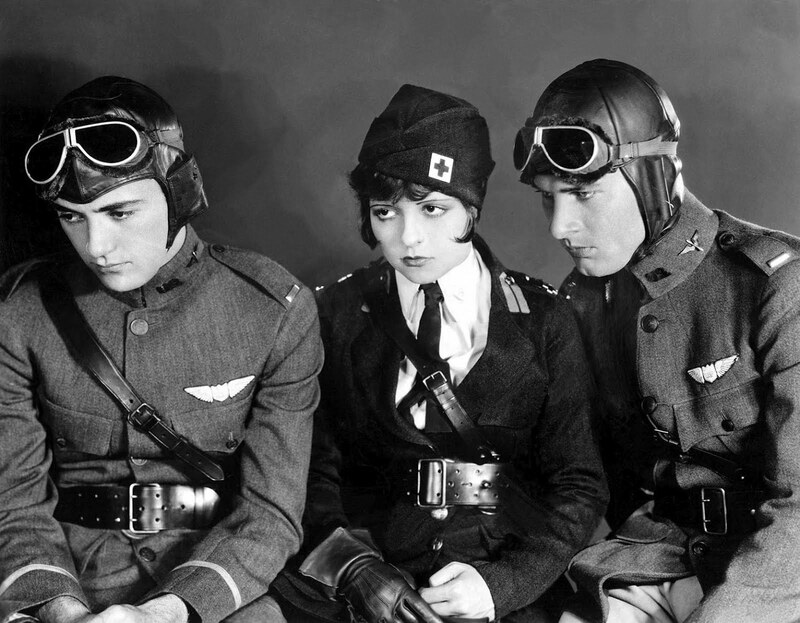 This summer's schedule includes 'Wings' (1927) on Flag Day, Thursday, June 14; the romantic comedy 'It' (1927) starring Clara Bow on Thursday, July 12; and Buster Keaton's uproarious comedy 'The Cameraman' (1928) on Thursday, Aug. 9. The screenings allow audiences to experience silent film artistry in the way its makers originally intended: on the big screen, with live music, and with an audience. Rapsis, a New Hampshire composer who specializes in film music, will create the score for 'Wings' on the spot, making up the music as the movie unfolds to enhance the action on the screen as well respond to audience reactions. He will perform the music on a digital synthesizer, which is capable of producing a wide range of theatre organ and orchestral textures. "Live music was an integral part of the silent film experience," Rapsis said. "But most films at the time weren't released with sheet music or scores. Studios left it up to local musicians to come up with an effective score on short notice. The results could vary, but at its best this approach created an energy and a connection that added a great deal to a film's impact. That's what I try to recreate," Rapsis said. 'Wings' is about 2½ hours long and will be shown without intermission. The film is a family-friendly drama but not suitable for very young children due to its length and intense wartime battle scenes. The public is welcome—especially all veterans! 'Wings' will be screened on Thursday, June 14 at 6:30 p.m. at the Flying Monkey Movie House and Performance Center, 39 South Main St., Plymouth, N.H. Admission is $10 per person. For more information, call (603) 536-2551 or visit www.flyingmonkeynh.com. Next up: a futuristic fantasy in a theater that's like stepping back in time. Talk about contrasts! 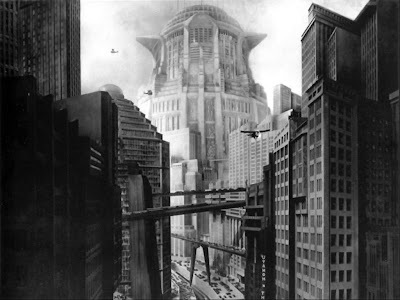 But that's what you'll experience on Friday, June 8 if you drop by the Leavitt Theatre in Ogunquit, Maine, where I'm doing live music for a screening of 'Metropolis' (1927). The screening starts at 8 p.m., but the theater itself started in 1923, and remains virtually unchanged. Really! As a summer-only moviehouse in a seaside resort that's been under one owner for decades, there's been little reason to remodel. Season after season, the Leavitt has been doing what it was build to do: screening movies. However, it's no palace. The place is functional at best: built for the summer tourist crowds and caressed by cool ocean breezes, the space lacks heat or air conditioning. Most of the seating is completely original; wooden seats still carry wire loops underneath for gentlemen to store their hats! So even though projection and sound equipment have been upgraded, the theater itself, with its steeply raked floor and curious balconies and smell of wood, is very much like what an audience would have experienced way back during the silent film era. So that's where Dr. Strangelove got the idea! 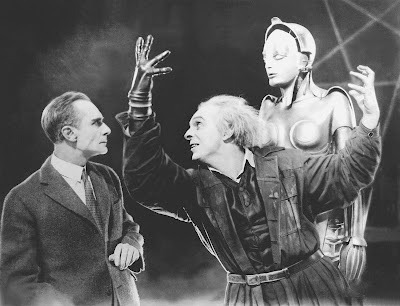 OGUNQUIT, Maine—A silent film hailed as the grandfather of all sci-fi fantasy movies will be screened with live music on Friday, June 8, 2012 at the historic Leavitt Theatre in Ogunquit, Maine. The show starts at 8 p.m. and tickets are $10 general admission. The story centers on an upper class young man who falls in love with a woman who works with the poor, and encompasses mad scientists, human-like robots, and industrial espionage, all set in a society divided into haves and have-nots. The version of 'Metropolis' to be screened at the Leavitt is a newly restored edition that includes nearly a half-hour of missing footage cut following the film's premiere in 1927. 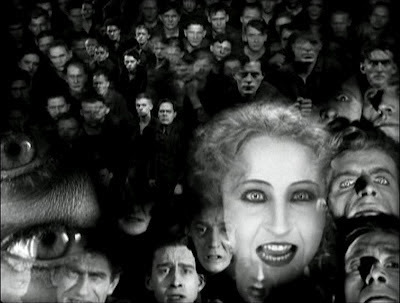 The footage, discovered in 2008 in an archive in Argentina, has since been added to the existing 'Metropolis,' allowing plot threads and characters to be developed more fully. The restored 'Metropolis,' now 2½ hours in length, will be accompanied by a new score created live by New Hampshire-based silent film musician and composer Jeff Rapsis. The film will be shown on the Leavitt Theater's newly upgraded digital projection system. "We felt the start of the summer tourist season was a great time to screen the restored 'Metropolis' at the Leavitt, as it's a film all about the excitement of things to come," said Rapsis, who provides live musical accompaniment to silent film screenings throughout New England. "'Metropolis' stands as an stunning example of the power of silent film to tell a compelling story without words, and reach across the generations to touch movie-goers from the real future that came to pass, which means us." and the city below ground. The Leavitt, a summertime only one-screen theater, will open for its 89th season on Friday, May 18 with a three-day engagement of 'The Artist' (2011), the silent film that won multiple Academy Awards at this year's Oscars, including 'Best Picture.' Because 'The Artist' is a Valentine to the silent movie form, Leavitt owner Peter Clayton decided to augment it by programming 'Metropolis,' one of the undisputed classics from the silent era. 'Metropolis' will be shown as it was intended to be shown: in a real theater, on the big screen, with live music, and with an audience. "Even in this age of sophisticated home entertainment, there's nothing like the shared experience of seeing a silent movie in a crowded theater," Clayton said. "The live music by Jeff Rapsis, whose presented silent films at the Leavitt for the past two seasons, is another part of the show that can't be duplicated at home," he said. One of director Fritz Lang's more ambitious montages. 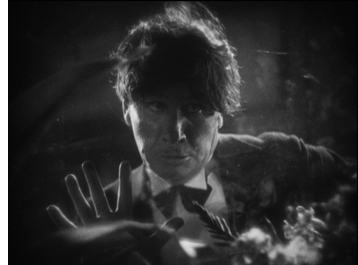 To accompany silent film, Rapsis uses a digital synthesizer to recreate the texture of the full orchestra. The score is created live in real time as the movie is screened. Rather than focus exclusively on music of the period, Rapsis creates new music for silent films that draws from movie scoring techniques that today's audiences expect from cinema. "Silent film is a timeless art form that still has a unique emotional power to move audiences, as the recent success of 'The Artist' has shown," Rapsis said. "With original silent films such as 'Metropolis,' which are from another era, I try to help them come to life by using music to bridge the gap between the film and today's audiences. If you can show them as they were originally intended—on the big screen, in a restored print, with live music and an audience—they create the same kind of excitement that made people first fall in love with the movies." 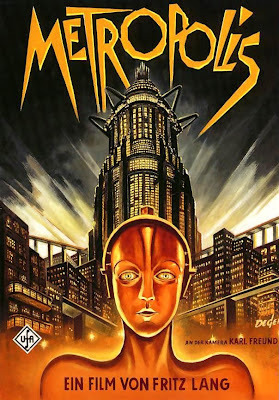 The restored 'Metropolis' will be shown on Friday, June 8 at 8 p.m. at the Leavitt Theater, 259 Main St., Ogunquit, Maine. General admission tickets are $10 per person. For more information, call (207) 646-3123 or visit www.leavittheatre.com. For more information on the music, visit www.jeffrapsis.com. 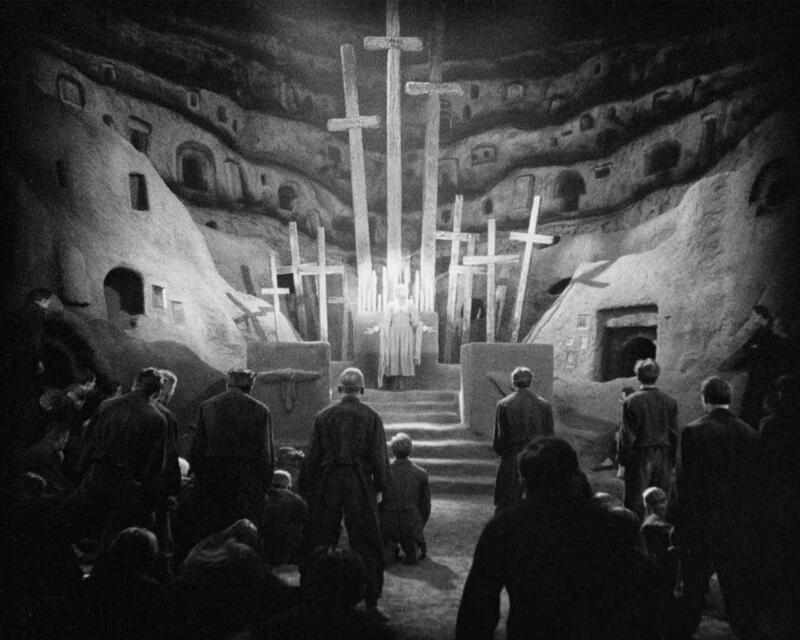 'Underworld,' (1927), a picture I've never done before, is the feature for a screening on Tuesday, June 5 at 6 p.m. at the Manchester (N.H.) Public Library. An early film from director Josef von Sternberg, it has an abundance of great black & white photography, with an emphasis on shadows. But for music, I'm not sure. I think the temptation will be to do a lot of 1920s-style jazz, but somehow that doesn't seem right to me. I keep thinking the model might be the music that Marvin Hamlisch wrote for Woody Allen's 'Take the Money and Run' (1968) might be a better model. We'll see. I think another big challenge will be getting the audience to take seriously George Bancroft's haircut. As gangster Bull Weed, Bancroft cuts a pretty mean figure, but for much of the film his hair looks ridiculous. The photo at left provides a good idea of what you're in for. 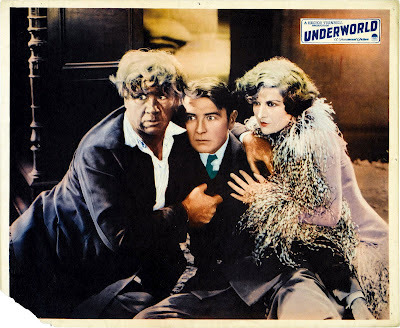 MANCHESTER, N.H.—'Underworld' (1927), a silent drama that spurred a boom in 'gangster' movies, will be screened with live music on Tuesday, June 5 at 6 p.m. at the Manchester (N.H.) Public Library, 405 Pine St., Manchester, N.H. The film will be accompanied live by silent film musician Jeff Rapsis. Admission is free; donations are encouraged. 'Underworld,' directed by Josef von Sternberg and starring George Bancroft, is notable for being the first major motion picture to portray a gangster in a sympathetic light instead of a villain. Its popularity touched off a boom in Hollywood gangster pictures that reached its peak following the stock market crash of 1929. 'Underworld' is the latest in a monthly series of silent films presented with live music in the Manchester Public Library's vintage 1913 Carpenter Auditorium. 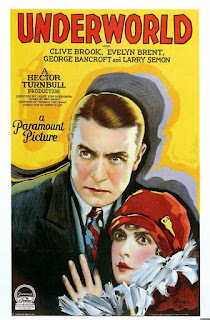 A wide range of rarely seen silent films are shown at the library, with screenings generally taking place on Tuesdays at 6 p.m.
• Tuesday, June 26, 2012, 6 p.m.: 'Spite Marriage' (1929); Buster Keaton's last silent feature finds the poker-faced comic smitten so much by stage actress Trilby Drew (Dorothy Sebastian) that he joins the cast of her production. The fun really starts when she asks Buster to marry her, but only to get even with an old flame. Classic Keaton comedy, underrated and full of great routines. Admission free, donations encouraged. • Tuesday, Aug. 7, 2012, 6 p.m.: 'Four Sons' (1928); director John Ford's drama about four brothers from Bavaria who become embroiled in World War I — but not on the same side! Interesting period drama set in Europe, carried by great story but with plenty of historical interest as well. Admission free, donations encouraged. • Tuesday, Aug. 28, 2012, 6 p.m.: 'Chicago' (1927); the original big screen adaptation of the notorious Jazz Age tabloid scandal, based on true events. Dancer Roxie Hart is accused of murder! Is she innocent or headed for the slammer? Later made into the popular Broadway musical. Admission free, donations encouraged. 'Underworld' will be shown on Tuesday, June 5 at 6 p.m. at the Manchester (N.H.) Public Library, 405 Pine St., Manchester, N.H. Admission is free, with donations encouraged to defray expenses. For more information, visit www.jeffrapsis.com. Silent film screenings at the Manchester Public Library are sponsored by Red River Theatres in Concord, N.H., a non-profit 501(c)(3) organization dedicated to screening a diverse program of first-run independent films, cult favorites, classics, local and regional film projects, and foreign films. For more information about Red River Theatres, visit www.redrivertheatres.org.